This is about my most recent trip with a friend of mine – Mao. We booked this trip last July 2008 when Air Asia had a seat sale. I got my ticket for a great bargain – 3,600 pesos net for a round trip ticket from Clark to Kota Kinabalu in the Borneo side of Malaysia. Mao and I used to jog together in UP back when he still worked in Manila and hang out in the mall, share stories and joke around. This was our first trip together and what made this trip more memorable was the people we met, food we ate, stuff we did and the things we learned about each other. CouchSurfing from what I understand is a networking community for travelers. They have this site where you can meet fellow travelers, show them around or let them stay in your place. I’ve been hearing a lot of great feedback about it from my friends who are seasoned travelers. Mao is one of its active members while little me is the loner type of traveler who does not have a Couch Surfing account (well not yet anyway, but I’ll sign up soon). Weeks before our flight, he met Kuni online, a Japanese guy who is willing to host us during our stay in Kota Kinabalu – meaning, he will let us sleep in his house and share information about Kota Kinabalu. After interrogating Mao about our host who he only remembers by his first name, I felt satisfied that he knew what we were getting into and I agreed to stay with Kuni. Couch Surfing has this feedback system – like the one you find in Ebay and from there, you can check out what kind of host or traveler the person is. At that time, Kuni had 140 guests who stayed with him and everyone gave great feedback about him. Around 7:40PM, our plane kissed the tarmac of the Kota Kinabalu International airport. I checked my surrounding, some rain began to fall..and oh mother of nature, it was also raining cute guys! Backpackers from different nations, of different features and sizes were pouring from the plane and it’s not just the backpackers, even the Malaysian guys are handsome! From then on, I knew it was God’s way of telling me that this would be a great trip. Going through the immigration was supposed to be a breeze had it not been for the guy who made time stopped for me. The guy in the counter was a hotteraazzi and I couldn’t resist but give him my “just ate the best chocolate cake look”. He smiled back. Oh my gosh. I didn’t know it was possible he could get any cuter. Then he turned all serious again, went through my documents, ask me my purpose of visit to which in my mind I could have said “You are the U in my PURPOSE.” Hahaha! Well, luckily, I was able to control the words coming out of my mouth and instead, I said “holiday”. I gave him another lingering smile and he smiled back and we parted ways. It kind of reminds me of the star-crossed lovers Romeo and Juliet in their balcony scene. I joined Mao and Eamonn. Eamonn is an Irish couch surfer and we met him in Clark Airport. Incidentally, he will also be staying with us in Kuni’s place. We grabbed several travel information from the airport and then we met Kuni at the aiport exit doors. He is this tall, warm and friendly Japanese guy and instantly I felt at ease with him. We drove to his place, which was about 10 minutes away from the aiport, to drop our bags. 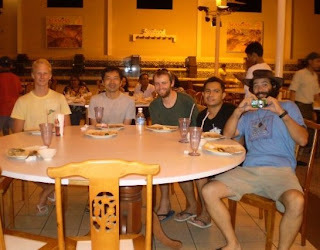 When we got there, we met two other couch surfers – Tommy from Sweden and Ervin from France. They were both traveling alone. Not only was I the only girl, but I was also the only one who is not a member (just yet) of CouchSurfing. Nevertheless, I felt very welcome and though we were from different nations – of different cultures and values, we were united with our passion to explore. We walked to Grace Point to have dinner. It’s a very posh-looking food court which sells meals for as low as 5 MYR. They have a variety of food choices from Indian, Japanese and the local food. It’s also a great place to hang out and after eating, you can take a stroll in the park beside it. Mao and I haven’t had our pesos changed to Ringgit but Mao still has 20 MYR from his previous trip in KL so that’s what we used. After buying a decent meal with drinks – we still had 3MYR left and some coins. It was a huge change compared to spending in pesos. Back home, 10 pesos can only get you some crackers, candies or street food. It can’t even buy you an extra rice in Mc Donald’s. During and after dinner, we talked a bit, joked around. Most of the guys have been to the Philippines and I got the chance to chat with Tommy who also loves the food in Sagada..ahh, a kindred spirit. Here's a shot of the group. I'm not in the picture because I took the shot. We turned it before 11:00pm and Mao and I decided to go to Kinabalu National park the following day, which is the jump-off to Mt. Kinabalu. 2. Gaya Street Sunday Morning Market – open only on Sundays (obviously), from 6am to 12pm (I’m not sure about 12pm though, may be until 1pm). Kota Kinabalu has other shopping malls to cater to whatever floats your boat – be it posh finds or bargain stuffs. Night Market near Waterfront – for fresh, grilled sea foods and other local delicacies. You can also eat with your bare hands. Upperstar – this is where Kuni treated us for a beer. We tried the Tsing Tsao – a Chinese beer. It tastes a lot like San Miguel beer but with less after taste. I drank it with chocolate cake and finished it in no time. Yummy! They sell cheap, great food (like pastas, fish balls) and cheap great beer. Love it! The Tsing Tsao beer is sold at 4 for 14MYR. No dress code here either. Lost or haven’t decided where to go? Just go to the Sabah Tourist Information center. This is where you can get a colored map of Kota Kinabalu, information brochures, hostels, bus schedules. The people here are very helpful and accommodating. There are lots of Filipinos in Kota Kinabalu and most people speak English though not all speak fluently so just drop the articles and go straight to the point. Going around shouldn’t be a problem, lots of friendly people to ask for directions.